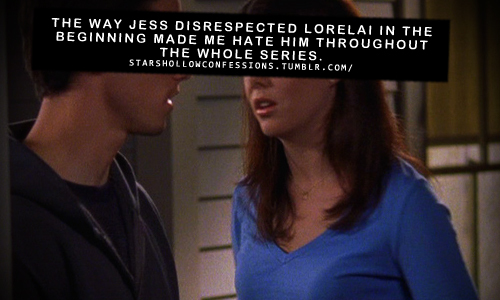 Jess Confessions :). . Wallpaper and background images in the Jess Mariano club tagged: gilmore girls jess mariano milo confessions lorelai tumblr. You and my mother both. It's only been in the last few months that she's been able to see the good in him. I'm not saying he was right to say what he did, but she was poking at a very, very raw spot for Jess, and presuming to know things that she had no clue about...no clue at all. It didn't just make him angry. Her words were excruciating. He wanted to make her stop talking and go away. And he was perceptive enough to know exactly how to do it. He wanted her to hate him. So she did. And so did you. She was presuming (and stating) that her childhood and her relationship with her parents was just as troubled and painful as his. He'd never known his father. His mother was a mentally unstable alcoholic who smoked marijuana. She'd brought countless jerks of boyfriends and husbands in and out of his young life. Comments regarding his mother's past relationships, weddings and experiences with pregnancy suggest horror stories. For Lorelai to attribute all of this to him having a petulant "my parents don't get me" attitude, and to tell him, "I mastered it all, in heels, no less," was absolutely inflammatory. Yeah. He was a little punk in the way he talked to her that night. But, what I saw was a hurt animal lashing out in pain. Forgive the rant. I just have rather vivid mental images of little boy Jess and all the hurt he was subjected to...and it brings out my maternal instincts.